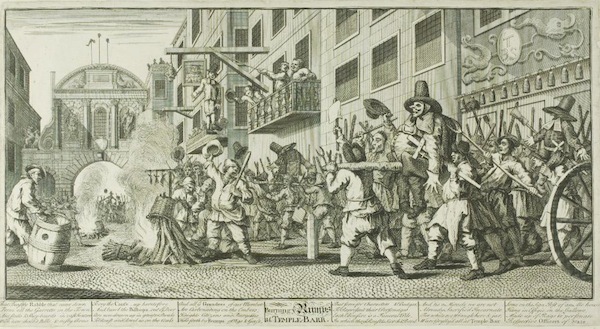 William Hogarth Illustrations for Samuel Butler’s ‘Hudibras’. On October 19th, Trenton Oldfield was sentenced to six months in prison for his protest against elitism that saw him disrupting the Oxford Cambridge boat race. He was found guilty of causing a public nuisance. Many others have remarked on the outrageousness of a prison sentence for this act of protest, this act of political dissent. It is entirely disproportionate, and reflects a perceived increase (more on that below) in the criminalisation of political protest by a state bent on punitive austerity measures that are affecting the poor, the unemployed, working peoples, peoples with disabilities, single mothers, and other vulnerable and marginalised communities entirely disproportionately. The fact that the judiciary is comprised of 78% of Oxbridge graduates has been pointed out, drawing attention to a serious and well entrenched problem, the lack of what is obliquely referred to as “diversity” on the bench, and the interests that this majority of white elite men ultimately serve. The epistemological questions related to the capacity of judges to understand the life experiences, not to mention the political and legal consciousness of the subjects who appear before them has led to a globalised field of judicial (re)-education programmes and academic projects that re-write judgments from feminist and anti-racist perspectives as a way of imagining a judicial system that would be more representative and democratic. These projects are important and their value in realising change should not be underestimated. However, I want to focus here on something else. I want to focus on the relationship between the right to protest, political dissent, and private property (or, the bourgeois state of law). In my view, Zizek has a good point. The right to protest and to not be criminalised as a result of said protest needs to be articulated as opposition to a legal system whose raison d’être is to protect a system of private property. Private property here is understood as being inclusive of many different things, including the properties that attach to individual ownership and wealth. These properties are affective and intangible and yet, have the most material of consequences. The sense of entitlement, privilege, security and power that attach to actual relations of ownership constitute the regime of private property that our current system of law works to uphold in manifold ways. As Bentham put it so well, the primary purpose of law is to provide security for private property interests. So, this struggle to stop the criminalisation of political dissent, our outrage at sentences such as the one handed down today,3 cannot only be about the right to political protest itself, and the desire for a more just system that does not come down so viciously on people protesting the rise in student tuition fees, austerity, the war in Gaza, police brutality, etc. While that would certainly be welcome, there is something rather more rotten in the state of the law itself. The very substance of the laws used to criminalise political dissent require a robust anti-capitalist, anti-racist, feminist critique that was once par for the course in both critical legal scholarship, critical race theory, and political activism. The crime of public nuisance has an interesting history. The word itself, spelt ‘nusance’ until the 18th century, “originally meant no more than ‘harm’.5 Theft contaminates its etymological roots, lawyers having stolen the term “from ordinary speech, assigned [it] a technical meaning, and then accused the man in the street from misusing [it].”6 Nuisance originates during the feudal era as a private law action in tort, to protect individuals from any interference with their property short of actual dispossession. The tort of nuisance grows as a type of action between neighbors, but as early as the end of the 13th century, the private concern with property had drifted into the concept of public nuisance. The main concern was with the common benefit and the obstruction of highways by agricultural waste and effluence. It is not until the 16th century that, in the local criminal courts of the King, what are now considered to be ‘public welfare offences’ come to include a wide range of actions considered to be harmful to the community. The crime of public nuisance was used prolifically in the colonial context. And while there has been an intensification in the length of prison sentences handed out to those involved in the riots of August 2011, and the student protestors, the criminalisation of political dissent in the UK has a long history elsewhere, a history in which the colonies functioned as a legal laboratory for methods of suppression and subjugation. Michael Anderson notes that after 1870 in India, public nuisance crimes “represented the most frequent and systematic application of police power under colonial rule.”9 If we want to think, historically, about the perversion of the term “public interest” one need only look to the colonial context. It is in colonial India, as in Mandate Palestine (and in present day Israel/Palestine), that land, water, resources, and thus the livelihoods of people were and are routinely appropriated in the name of the “public” interest and for “public use”. The concept of the “public” in colonial settler contexts is as tainted as the concept of sovereignty that represents settler interests at the expense of indigenous ones. When we think about the propertied nature of whiteness that endows particular communities with such a strong sense of entitlement to economic, social, cultural and political privileges over others, colonial histories and histories of slavery that have been fundamental to the development of English law and capitalism can only deepen our understandings of contemporary judgments about what the interests of the “public” are and conceptualisations of public space. If the 18th century was a time when the crime of public nuisance punished behaviour deemed to be improper, lacking in the propriety expected of loyal subjects, the 19th century witnesses a coupling of the disciplinary dimensions of public nuisance with the use of this offence to protect private individuals from interference with their rights in real property. A private citizen, by the 19th century, could obtain an injunction against a public nuisance if it threatened physical damage to his property. We have seen the effects of this use of public nuisance in recent injunctions sought to suppress political protest on campuses, and against the Occupy protestors at St. Paul’s. Interestingly, and as a small corrective to Zizek’s criticisms, the Occupy London protestors did attempt to disrupt and challenge the property rights of the City of London by asserting an indefinite right to occupy. Property rights are never indefinite, but exist as ascertainable periods of time, and thus by challenging the temporal framework of property the Occupy protestors attempted, albeit unsuccessfully, to alter the very fabric of property law. Nearly if not all of the type of public nuisance offences that the law was historically intended to apply to have now been covered by statute. The profligate doctrine of health and safety breeds new rules and regulations daily it seems; and criminal law offences have become increasingly codified. What is left, after all of this content has been emptied out is a dangerously elastic form of criminal offence that can literally be applied to any sort of conduct. And with this, we arrive at Oldfield’s sentencing hearing. The Court found that Oldfield “decided that he had the right to stop members of the public enjoying a sporting competition which they had chosen to go and watch.” Justice Molyneux tells Oldfield in no uncertain terms that “he did not have that right…” and that he had “given himself the right to spoil the enjoyment of others.” Here the property interests at stake appear quite clearly. Oldfield is guilty of disrupting the rowers’ sense of entitlement to carry on with their sporting event over and above his right to participate in direct political action, shored up by years of customary use, and rendering their right to use the river as they wish, according to their long-held tradition, insecure. Oldfield not only violated and disrupted these long held privileges, but he is described as having “given himself the right” to do so. Oldfield is a lone individual who ‘gave himself the right to protest’, he is not a concerned individual expressing a political position that resonates with thousands upon thousands of people who have taken to the streets, who have written, who have rung their hands in the air, who have organised conferences, demonstrations, strikes, poetry readings, art installations, made films, all in order to protest government attacks on social services, education, and the politics of austerity generally. Marx illuminated how the passage to a liberal democratic capitalist society essentially pulls a veil over actual inequalities in power and material wealth, leaving us with the illusion of equality between ostensibly sovereign individuals. The notion that Oldfield was ‘prejudiced’ (against the Oxbridge rowers) reflects a concerted effort to ignore the obvious differences in privilege and wealth of the participants in the race and those on whose behalf Oldfield was protesting. In the context of this public nuisance action, all parties are on equal footing, the rowers from Oxbridge and Cambridge as vulnerable to suffering the effects of prejudice as any other group of people. Of course it would be just if the State were to stop criminalising political protestors, and this is necessary, at a minimum. But political transformation lies in challenging the nature of private ownership that pervades the very form that law takes. In the Economic and Philosophic Manuscripts of 1844, Marx writes that the “huckstering with landed property, the transformation of landed property into a commodity, constitutes the final overthrow of the old and the final establishment of the money aristocracy.” Huckstering, Marx tells us, is what defines the very essence of ownership (whether it’s feudal or capitalist, of land or money). Perhaps huckstering is also an apt and analogous term for the use of law to criminalise political dissent. What we are being offered here (what is being peddled) is a version of the law that deems it criminally improper to disrupt the entitlement of the wealthy to enjoy sport, to assert a noisy, visible presence in public space, to challenge the increasingly private ownership of our universities. Perhaps one place to begin in reconceptualising a law of public harm is to imagine laws that are not tied to the protection of property in all of its glorious diversity, but conceives of public harm as that which damages the life chances of that majority living on the margins of socio-economic privilege. Brenna Bhandar is Lec­turer in Law, Queen Mary, Uni­ver­sity of London. I read this article and found it very interesting, thought it might be something for you. The article is called The Criminalisation of Political Dissent: Huckstering the Law and is located at http://criticallegalthinking.com/2012/10/22/the-criminalisation-of-political-dissent-huckstering-the-law/. I am one of those rowers, and you are right, there is a difference between the wealth of myself and Oldfield. I rent a room in a house where we don’t turn on the heating because we’re students and can’t afford the bills. Oldfield lives in a £350k house in Whitechapel. The wetsuit he was wearing cost about as much as I spend each year on food. You’ve made the mistake of assuming people from Oxford and Cambridge come from wealthy backgrounds because you are prejudiced. Maybe you should read the judge’s statement again. First, I don’t think anyone would claim that everyone at Oxbridge was universally rich, but a brief look at the stats on numbers of first year entries from private schools and kids who had been on free school meals will demonstrate the point about privilege admirably (famously at one point out of 6000 undergraduates, if I remember correctly, there were 20 kids in Cambridge who had been on free school meals and 25 in Oxford). I cant believe I even need to say this, but the fact that you claim to live in penury while attending Oxbridge does not alter the fact that Oxbridge perpetuates a massively stratified society. Second, just because someone lives in an expensive house does not mean that they must be silent about injustice and inequality. There are poor conservatives, and rich communists. We all must live in this world. That does not stop us striving for a different one.